China’s Li Jingliang has paid his dues in fighting and in life. In March, he turned 30. Now the fun begins. That idea of attacking life and not waiting for it to happen has translated into his fighting style, one that has led him to wins in six of his nine UFC bouts heading into a Saturday showdown with Japan’s Daichi Abe, one that many believe is a strong candidate for Fight of the Night honors. Why? Well, it’s because “The Leech” always shows up ready to throw down, with the result being post-fight performance bonuses in each of his last three bouts. 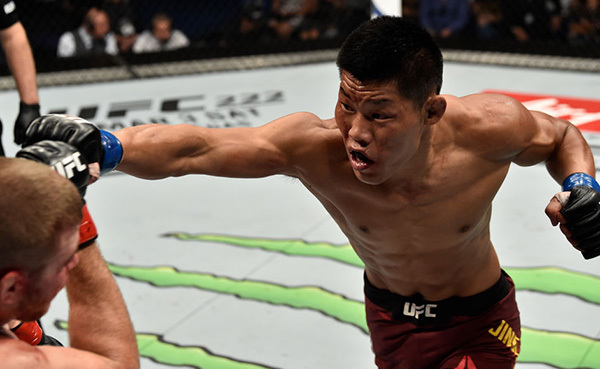 In 2016-17, Li evolved from a raw talent into a legitimate welterweight threat, as he won four fights in a row, three by knockout. Included in that quartet of victories was a Performance of the Night finish of Zak Ottow and a Fight of the Night with Frank Camacho. He earned another Fight of the Night bonus in February against Jake Matthews, but saw his winning streak snapped by the Aussie up and comer. If Li is firing on all cylinders, it could end up to be a bad night for Abe. And that’s just what Li has planned for him, as he looks to deliver another performance to remember for his growing fan base, one he is very thankful for.